Editor’s note: Kevin Zeese is co-director of Popular Resistance and a senior adviser to the Green Party’s Jill Stein-Ajamu Baraka campaign. Donald Trump is campaigning to win 40 percent of the vote for president—and he’s close, with recent polls showing him in the high 30s. But his final performance will not help. Trump is focusing on topics that will prevent him from broadening his base, such as the women he accuses of lying about his alleged sexual assaults, and what he calls the rigged election. He is fighting with other Republicans, like Paul Ryan, and with Republican state leaders, most notably in Ohio. His refusal to say he will accept the outcome of the election is creating more conflict with Republicans and raising doubts with voters. Outlets predicting the results of the election say Clinton will be the next president, with astoundingly lopsided odds. The Huffington Post gives Trump only a 3.1 percent chance of winning and puts Clinton’s likelihood at 96.8 percent. The New York Times gives Clinton a 93 percent chance. When it comes to swing states, Clinton is equally strong. There were 11 battleground states when the campaign began. Clinton has an insurmountable lead in six states, including Colorado, Michigan, New Hampshire, Pennsylvania, Virginia and Wisconsin. Winning these states would give Clinton a majority of the electoral college. She is in position to win all of the remaining battleground states, but doing so is not necessary. Trump is only competitive in a couple of these states. Traditional Republican states like Georgia, Arizona and even Texas are moving toward Clinton. Stuart Rothenberg, a longtime top political analyst, writes: “It would be a mistake to call Trump’s current path to an electoral-college victory narrow. It is nonexistent.” Charlie Cook, who for decades has been a cautious prognosticator, recently wrote: “This race is OVER.” Larry Sabato’s Crystal Ball has Clinton winning 352 electoral college votes. And Republican strategist Steve Schmidt says Clinton could win an astounding 400 electoral college votes. What is a ‘strategic’ vote? With this clarified political reality, what should a voter who was going to support Clinton in order to stop Trump do? Many voters were going to hold their nose and be “strategic” by voting for Clinton in key states that were in contention. This is no longer an issue, with Clinton on her way to a landslide electoral college victory way beyond the 270 votes she needs, and Trump is unlikely to even break 200 electoral college votes. With Clinton assured of victory, there is no reason to vote for what you oppose or for a candidate and party that do not respect people in the movement for economic, racial and environmental justice. The job now is to begin to organize to stop Clinton’s worst instincts. If the prognosticators are right and Clinton wins a decisive victory, what can we do to ensure that she listens to the voices of the popular movement? Voting for Clinton to add to her easy victory only strengthens her. Her history of supporting war and regime change is likely to result in escalation of the U.S. role in the war in Syria. She has promised a no fly-zone, which is likely to lead to greater conflict with Russia, a country she has been very vocal about containing. She has a long history on the domestic front of supporting the views of Wall Street and promoting market-based policies. 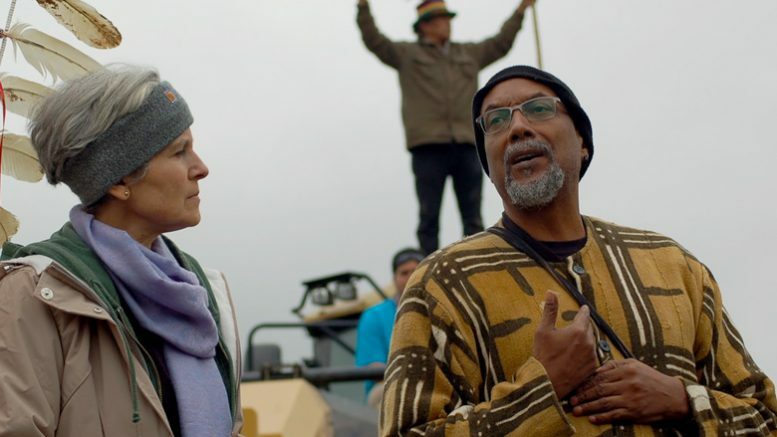 In contrast, every vote for the Green Party’s Jill Stein/Ajamu Baraka ticket would increase the strength of the social justice movement it represents. The Stein-Baraka campaign stands with the movement and has put forward its message. If Stein and Baraka get over 5 percent of the vote, it would mean the movement would be a threat to Hillary Clinton’s re-election, pushing her to take the views of progressives into account. The social movement needs to organize to show opposition to Clinton’s Wall Street and war policies. We urge people to plan #NoHoneymoon for Hillary protests beginning in early 2017 and continuing through the inauguration. This will begin a presidency of protest in which the popular movement can push to make sure its agenda is part of the political culture and that the necessities of the people and planet are achieved. After the election, activists should focus on making sure the Trans-Pacific Partnership trade pact is not ratified during the lame-duck session of Congress, which begins Nov. 14. Opponents of the TPP are holding a No Lame Duck action camp beginning Nov. 12, to be followed by protests in Washington. Sign up for the no lame-duck actions at www.flushthetpp.org/nolameduck. Even though in this election the corporate duopoly put forward the two most unpopular presidential candidates in American history, they were able to control the campaign narrative and, for the most part, keep independent parties out of the conversation. The two big-business parties have put in place multiple methods of control. This includes the difficult ballot-access process, which requires independent parties to spend millions of dollars just to be on the ballot. Strategic voting to build an alternative can change that. If Jill Stein gets 5 percent in every state and the Greens get their normal vote for certain offices (e.g., governor of West Virginia), Greens would then be on the ballot in 33 states. This would mean a major savings in both money and volunteer time for gathering signatures on ballot-access petitions. Winning 5 percent is within reach for Stein-Baraka. In fact, the Investors Business Daily presidential poll has them at 5 percent. Both the NBC and Politico’s Morning Consult polls found Stein at 4 percent. And because of the way polls are conducted, generally weighted to expect fewer young and first-time voters, they could be underestimating Stein’s support. Scott Keeter, a senior survey adviser at Pew Research, told The Atlantic that polling methods “may be losing some of their accuracy because circumstances have changed.” Strategically investing a vote for Stein-Baraka could pay multiple dividends for progressives. Because the Green Party does not take money from PACs or business interests, money is always in short supply. Jill Stein was able to meet the requirements of raising sufficient contributions to get federal matching funds during the primary phase of the campaign (raising $5,000 in 20 states, counting only the first $250 of each donation). If Stein-Baraka achieves 5 percent in the general election, then in 2020 her campaign will be able to pay off any debt from this campaign and get federal matching funds in that general election, which could mean millions of dollars. There is a lot that independent parties can do after this election to build their infrastructure, run candidates for local office and find ways to work together as an independent coalition in 2020. People are working on building unity in the independent political movement. The second national Left Elect conference will take place March 3-5, 2017, in Chicago, seeking to bring together candidates, individuals and organizations on the left to strengthen opposition to the two big-business parties. A major challenge is the phony Commission on Presidential Debates, which is really a disguise of the two dominant parties and is successful in keeping any challengers out of these events. Exposing the deception of this commission and finding a way to weaken if not destroy it needs to be on our agenda. The 2016 election now provides voters a rare opportunity in presidential politics. The easy upcoming victory of Hillary Clinton means people do not have to cast a fear vote in any state in the country. Everyone can vote for what they want, build the infrastructure of a party to challenge the two big-business parties, and begin to focus on movement organizing to stop the worst instincts of war and Wall Street that will be the Clinton presidency.